The Princess Zenebework Memorial Hospital, near Addis Ababa, was opened in 1932, with assistance from the American Leprosy Mission and the Sudan Interior Mission. The Order of Malta also established an institute for the study of leprosy in Tigre province. Ethiopia had been one of the first countries, if not the first, to request technical support from WHO in 1950. In 1974, in a population of 25 million, still five in one thousand people were suffering from leprosy. In the Central Highlands, it was more like ten to twenty five in one thousand and in the south-eastern highlands, there were slightly less, about ten to fifteen in one thousand. At that time, 48,352 people were being treated for the disease. Initial attempts at integrating leprosy into general medical services had fallen flat for several reasons. Static treatment centres were not suitable for such a scattered population, for a disease that was so stigmatised, and people were reluctant to draw attention to themselves by showing up at the specialised centres. The distribution of drugs was not well controlled either centrally or at the periphery. Clinics were poorly supervised and the standards of diagnosis and treatment were not good, then, “as a result of a bureaucratic decision to integrate, the regularity of attendance of patients fell to 10%, many of them failing to attend after the initial visit when they registered.” (Browne 79) Additionally, medical auxiliaries would treat other patients and overlook those with leprosy. Ethiopia had been the stage upon which cold war tensions were played out between American-backed insurgents battling against the Soviet-backed Derg government, and from which Mengistu Haile Mariam emerged as ruler in 1977. In 1984, Ethiopia officially became a Marxist-Leninist state, and Mengistu became the secretary general of the Workers’ Party of Ethiopia. The new leprosy programme coincided with a natural disaster of epic proportions in the nation that had been aggravated by the political regime’s war against the Tigrayan People’s Liberation Front in North Wollo from 1980 to 1985. The Ethiopian famines of 1983-1984 impacted on eight million people and possibly a million people died. 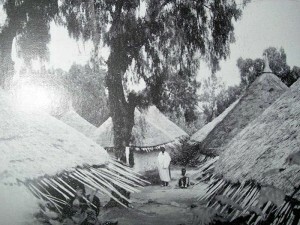 The famine, which followed the civil war, was especially severe in the highly leprosy-endemic districts/provinces of Wollo and Gojjam. Keneally writes that “The zone of severe famine coincided with the war zone and the phases of the developing famine corresponded with the military actions.” (Keneally, 139) The subsequent resettlement/villagization policy in 1985-86 brought Ethiopia to world attention and resulted in an outpouring of international aid. How these traumatic conditions impacted upon leprosy services and leprosy-affected people in Ethiopia is not apparent from WHO reports, although these events must have overshadowed the support given to the country’s espoused efforts to improve the health of its population, even while it was in the process of removing people from their traditional lands and resettling them in poorly suited and barely adequate sites with people from alien tribal groups or with people of other ethnicities. S. G. Browne, “Leprosy in the Community”, Lep Rev, 45 (1974): 78-82. N D Fraser, “A Review of Leprosy Work in Ethiopia, Uganda, N. Rhodesia and Tanganyika”, Leprosy Review 33.2 (1962): 141-153. Thomas Keneally, Three Famines (Sydney: Knopf, 2010). A J de Rijk, “Report on a WHO-Short Term Consultancy to the National Leprosy Control Programme in Ethiopia: August 15-September 16 and 12 days in October 1983”. WHO, “Leprosy Control in Ethiopia” [Programme of Leprosy Control Ethiopia L4 370 6 ETH].